"Is he or isn't he?" The title of this page is a direct quote from Ward Churchill's visit to the University of Hawaii recently. He was addressing the question all the media seem to be asking: Is he or isn't he an Indian? A Denver reporter by the name of Klev--Kevin Flynn, who actually specializes in racism on the radical right (has a book on it which I would recommend; it's very good... so he knows what he's doing) is assigned this story. Rather than displaying the integrity of saying there is no story here, it's not relevant what his pedigree might be, it would be the same story if he was african-american, or african for that matter, asian- american, or asian, latino, or any other plaid sort of group on the face of the earth--any group of humanity. The issue is the substance of what was said, whether it's accurate or not, whether there's logic to it, whether it furthers the discourse. That's the issue. But no, Mister I-know-all-about-right-wing-racism takes a specifically racial assignment to call my band office to find out if I'm who I say I am. Well, fair. Stupid acceptance of an assignment. Anybody with principles woulda refused it, but this is reporterly procedure. So that seems to put paid to all this "he's not an Indian" kerfuffle. He's an enrolled member of the United Keetoowah Band (UKB). He said so. In front of an audience. On television. Ah, but there are others who disagree. Who? Well, John Ross (who, while Chief of the UKB, invited Churchill to join). Ernestine Berry, secretary of the UKB when Churchill got his membership, and current UKB Chief George G. Wickliffe. Just those three. Just two UKB chiefs and a UKB historian and one-time secretary for the UKB. These aren't antagonistic rival Indian Movement people or competing tribes with axes to grind. These are officials and former officials of the UKB itself. According to United Keetoowah Band tribal council Chairman, John Ross, associate members "are basically honorary members who can't vote and have no rights to tribal benefits." Mr. Ross also pointed out that President Bill Clinton has been asked to become an associate member of the Keetoowah Band, "because we found out his mother had some Cherokee ancestry." To date, President Clinton has not accepted membership in the Keetoowah Band, but he better hurry. Because of cases like Mr. Churchill's, the United Keetoowah Band may soon cut off associate memberships. "Some tribal members are upset about it (the Churchill case), and others like it," and "there are too many people trying to get in," said Mr. Ross. It is also not necessary to prove any degree of Indian blood in order to be accepted as an associate member of the United Keetoowah Band. Applicants for associate membership need only to assert that they are descendants of someone who claimed Cherokee blood at any time in the past. Witness the case of President Clinton, where associate membership was offered solely on the basis of a news story about alleged Indian ancestry. According to UKB historian and former tribal secretary Ernestine Berry, Churchill was granted associate membership status in the tribe in the early 1990s, but is no longer listed as such. "After he got his associate membership, we never saw him again," said Berry. "He got that card and he was gone, gone, gone." Berry said that from the mid-'80s until about 1990, the UKB granted associate membership to tribal members' children who didn't have enough certified Indian blood to be members. The UKB requires voting members to be at least one-fourth Cherokee. Berry said associate members have no voting rights, and receive no benefits from the tribe. About 100 such memberships were granted, according to Berry. She said Churchill's associate membership was granted to him around 1993 by then-chief John Ross. "[Churchill] claimed to be part Cherokee, but he couldn't prove it; when I first met him, I didn't like him, and I didn't trust him," said Berry. "I told the chief, 'Don't do this, John; it will damage the integrity of the [tribal] roll,' but they went ahead and made him an associate member. He has since used that to promote his own purposes, and he has not helped the United Keetoowah Band at all." Berry said associate membership is no longer granted, and "the reason it's not is Ward Churchill." The former chairman of the Keetoowah band of Cherokee Indians says University of Colorado professor Ward Churchill was given an honorary membership that required no proof of Cherokee heritage. John Ross led the tribe for several years in the 1990s. He says the Keetoowah established an "associate member" program to recognize friends of the tribe. "If somebody helped out in a certain way, to honor them they'd give them an associate membership," Ross said Thursday. "There were 300 or 400 associate members." Former President Clinton also was given an honorary membership in the tribe. To be a full-fledged member of the Keetoowah, a person has to prove he or she is at least one-fourth Cherokee. Churchill has never had such a membership. Only full members are allowed to vote, hold office and receive tribal privileges. Churchill has cited his associate membership in the tribe as proof of his Cherokee roots. He told The Denver Post on Wednesday he is three-sixteenths Cherokee. In the past, he has described himself as one-sixteenth Cherokee and also claimed to have Creek Indian blood. Ross said Churchill came to several Keetoowah celebrations in the early 1990s and befriended tribal members, who decided they wanted to give him the associate membership. "He told the tribal council that if they needed him to lend a hand, he would," Ross said. He recalls Churchill offering to represent the tribe at an academic forum sponsored by the University of Arkansas. Eventually, Ross came to feel the associate membership program was being abused, and he asked the tribal council to abolish it. The Keetoowah haven't given out any new associate memberships since 1994. "There were a lot of people coming in and trying to use the associate memberships to elevate themselves," he said. "We decided we shouldn't give them out anymore and did away with it." Ross said some of the associate members were people who started claiming to be Keetoowah artisans. He says Churchill is also misusing his associate membership status. "In a sense, he's misleading people," Ross said. "He's like the others - that's what he's done." "[the United Keetoowah Band] has no association with Churchill in any capacity whatsoever and considers his comments offensive[.]" Recently, it has come to the attention of the United Keetoowah Band of Cherokee Indians (UKB) that Ward Churchill continues to promote himself as a Keetoowah member in order to substantiate his claims of Indian ancestry. The UKB is also aware of the apparent lack of understanding that the larger society has regarding Native America's enrollment policies. The United Keetoowah Band would like to make it clear that Mr. Churchill IS NOT a member of the Keetoowah Band and was only given an honorary 'associate membership' in the early 1990's because he could not prove any Cherokee ancestry. However, the associate rolls were discontinued shortly after Churchill received one: "Effective immediately, the UKB ceases to grant and/or recognize any/all future UKB Associate Memberships" - United Keetoowah Band Membership Amendment, 94-UKB-12A, July 9, 1994. Any records of past affiliations with the UKB are non-existent, and Churchill does not appear anywhere on our membership rolls. Mr. Churchill was never able to prove his eligibility in accordance with our membership laws, but was to be honored because of his promise to write our history, and his pledge to help and honor the UKB. To date, Churchill has done nothing in regards to his promise and pledge. The United Keetoowah Band, a sovereign Nation, has the sole right to determine our membership and interpret our laws. The term "Indian" refers not only to an ethnic category, but it is also a political determination based on our unique relationship with the Federal Government. Mr. Churchill mocks the basic fundamental principles of Tribal Sovereignty when he consistently refers to enrollment as a "pedigree" and compares enrollment to "dogs" and "Nazi policies." Additionally, his rhetoric did not prevent him from approaching the UKB and seek a so-called "dog pedigree." All of Churchill's past, present and future claims or assertions of Keetoowah 'enrollment' written or spoken, including but not limited to; biographies, curriculum vitae, lectures, applications for employment, or any other reference not listed herein are deemed fraudulent by the United Keetoowah Band, and should be respected by all media, government and private institutions to be so. The UKB is concerned that non-Indians, as well as many young impressionable Native Americans may take Churchill's assertions at face value. We hope to set the record straight regarding this individual. The United Keetoowah Band has no association with Churchill in any capacity whatsoever and considers his comments offensive. His remarks in no way reflect the true compassion for the victims of the World Trade Center and their families that is felt by the United Keetoowah Band of Cherokee Indians. On May 17, 2005 I was informed that the United Keetoowah Band of Cherokee Indians (UKB) has issued a Statement disavowing its relationship with me. This Statement contains many assertions which are categorically untrue: that I "asked" to be enrolled in the Keetoowah Band, that I was issued only an "honorary" membership in the Keetoowah Band, that my Cherokee lineage was never confirmed by the UKB Membership Committee, that I was never placed on the Band Roll. Each of these statements is documentably false. I did not "ask" to be enrolled; I was asked to apply. In May 1994, I was enrolled as Associate Member of the UKB. In June, I was issued a Band Card listing Roll Number as being R7627. As was stated clearly and repeatedly at a Keetoowah Band Council meeting conducted on June 4, 1994, during which my enrollment was discussed—and of which I have a complete record on videotape—Associate Membership in the UKB did require proof of Cherokee descent, and mine was confirmed not once, but twice by the Membership Committee before I was issued my Band Card and placed on the UKB Membership Roll. It was also made clear during the course of this meeting, and repeatedly so, that Associate and honorary memberships in the UKB were not the same thing. Then-Principal Chief John Ross was also quoted in both Ojibwe News and Indian Country Today as emphasizing the clear distinction between Associate and honorary memberships shortly thereafter. My status did not change when the Band stopped enrolling Associate Members on July 9, 1994. As recently as February 3, 2005, UKB Membership Committee member Ernestine Barry was quoted in the Denver press as acknowledging that the Band "no longer offers associate memberships, although it didn’t revoke any existing membership." When the "controversy" surrounding my comments concerning 9/11 first became a matter of national attention earlier this year, UKB representatives repeatedly confirmed, both publicly and privately, that I was an enrolled Associate Member. Moreover, I personally called UKB Principal Chief George Wycliffe [sic] in February 2005 and he assured me that there had been no change in my status. The United Keetoowah Band is a sovereign people. As such, just as it held the rightful prerogative to enroll me as a member in 1994, it holds the right to disenroll me in 2005. By the same token, it would be well within its rights to request that I relinquish my membership (i.e., "resign"). What it does not have a right to do is falsify history at its own convenience. Insofar as I’ve not been notified that I have been disenrolled, I can only assume that I remain an Associate Member of the United Keetoowah Band. Therefore, I cannot reasonably be accused of "fraud" for having represented myself as such. Further, even if I were to be disenrolled at this juncture, it would in no way affect the fact of my "Indianness," a matter officially confirmed by the Keetoowahs themselves in 1994. Ward Churchill received an “Associate Membership” from the United Keetoowah Band of Cherokee Indians in Oklahoma (UKB) council in May, 1994. He was not eligible for tribal membership due to the fact that he does not possess a “Certificate of Degree of Indian Blood” (CDIB) which is under the jurisdiction of the U.S. Department of Interior / Bureau of Indian Affairs. Because Mr. Churchill had genealogical information regarding his alleged ancestry, and his willingness to assist the UKB in promoting the tribe and its causes, he was awarded an ‘Associate Membership’ as an honor. However, Mr. Churchill may possess eligibility status for Cherokee Nation of Oklahoma, since he claims 1/16 Cherokee. “Associate Memberships” were only issued during the term of former Chief John Ross (1991 until the council voted to approve no more such memberships in July, 1994). It was made clear to all such members that they were not eligible to vote or receive any benefits. Federal law requires recipients of any benefits available to Native Americans to have a CDIB, which Mr. Churchill indicated he did not possess. The UKB’s eligibility for enrollment is based on providing documented evidence of direct lineage to the Dawes Roll enrollees, or to the 1949 UKB roll. Receiving an Associate Membership is akin to receiving an honorary doctorate, and then claiming to have received eight years worth of university education. The United Keetoowah Band of Cherokee Indians in Oklahoma hopes this statement clarifies the facts as we know them. It is our desire to not be distracted by such matters and continue helping our Elders and families here in our Nation. 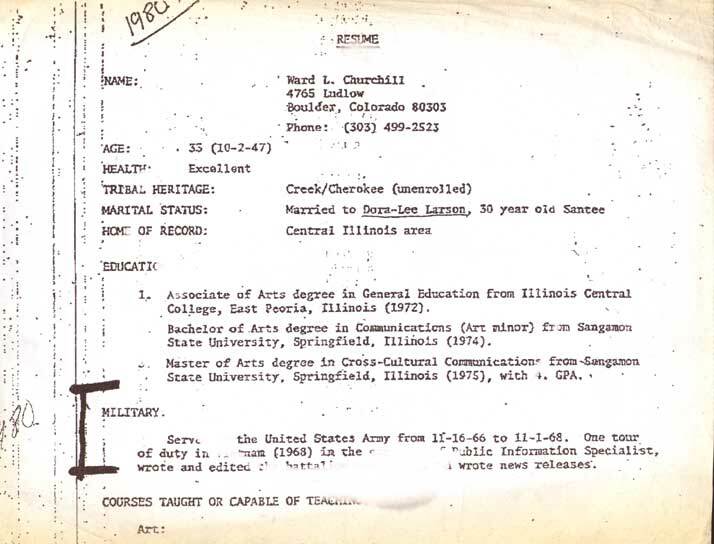 For further information regarding Mr. Churchill’s status as a Native American, please contact the United States Bureau of Indian Affairs in Washington , D.C. Nowhere have we found a single instance where any of these UKB spokesmen have repudiated or retracted the statements quoted above, so the direct quotes--until retracted--must be considered the UKB's final say on the matter. There's an ancillary question that comes up when considering Churchill's membership with the UKB: Why did he choose the UKB, which requires 1/4 Indian blood for full membership, over the Cherokee Nation, which has no specific "blood quantum" requirement? Churchill claims he chose the UKB because they were more activist. But it seems likely, or at least is quite easy to infer, that he chose the UKB by the simple expedient that they were willing to grant him membership with little or no inspection of his pedigree. In any case, back to the main questions. Who's right? Who's wrong? Who's lying? And most importantly: Is he or isn't he? The answer seems obvious.